4 Beds 3 Baths 1 Partial Bath 3,330 Sq. ft.
Beautiful 4 bdrm3.5 bath house in Wolf Creek Estates. Private yard acroos the street from park and community lakes and pathways. 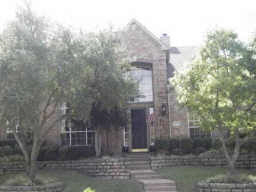 Marble entry, custom texture and paint throughout, remodeled kitchen with granite countertops and custom tile floor, salt water pool with spa, upgraded lighting fixtures throughout. Hardwood floors in family room and office. New roof Dec 2005. New backyard landscaping 2009. close to tollway, 121. Must see!